The Road To Sochi Tour is coming to Fountain Square in downtown Cincinnati on Friday, December 13th from 1pm to 7pm. 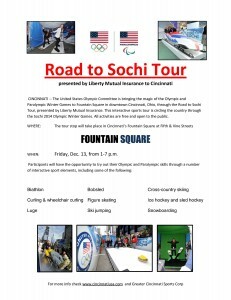 Hope people can come out cheer on Team USA and try some of the interactive exhibits. Rumor has it they are still looking for volunteers. The Cincinnati Curling Club is always looking for members, so pass this on to your friends and family.